Mom's favorite light Christmas cake recipe might be just what you've been wanting. These white fruitcakes with their delicate texture are very tasty, especially so for anyone who doesn't care for a heavier, darker cake. 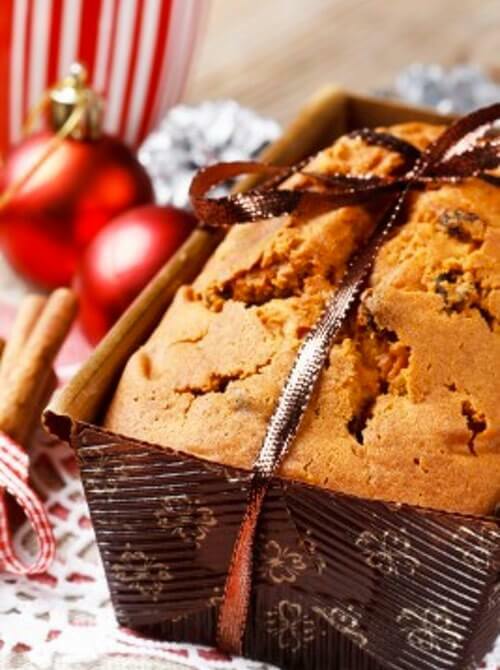 Try making a light fruitcake for the holidays and enjoy an old fashioned treat. 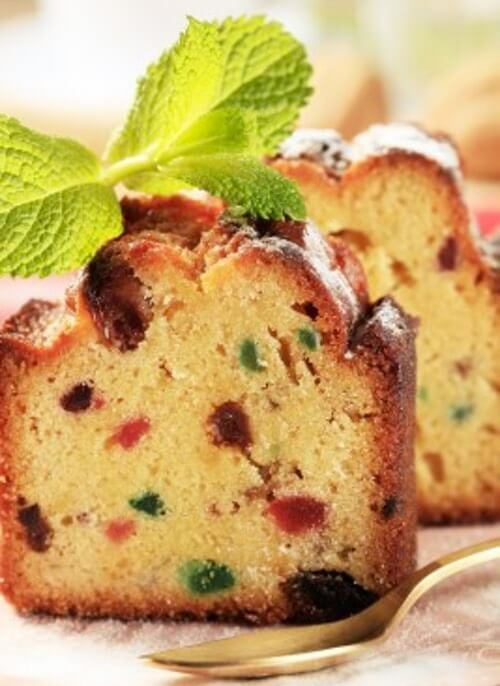 Light or white fruitcakes can be enjoyed year-round on any occasion. Frosted or non frosted, they taste so fruity and especially good. 1 cup butter, 2 cups sugar, 6 eggs, 1/2 cup milk, 3-1/2 cups flour, 3 teaspoons baking powder, 1/2 pound seeded raisins, 1/2 pound seedless raisins, 1/2 pound dates, 1/2 pound almonds, 1/2 cup citron peel thinly sliced. Mix and bake in a slow oven (250°F). Sift flour once, measure, add baking powder, soda, salt, and sift together three times. Sift 1 cup of this flour mixture over fruit and nuts; mix thoroughly. Cream shortening thoroughly, add sugar gradually, and cream together until light and fluffy. Add remaining flour mixture to creamed mixture, a small amount at a time. Beat after each additional until smooth. Add lemon juice, fruits and nuts. Fold in egg whites. Pour into a paper-lined tube pan or small bread pans. Bake in a slow oven, 250°F, 2-1/2 hours, then increase to 300°F, for 15 minutes. 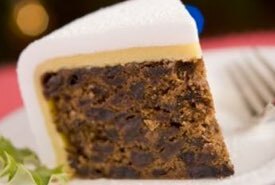 This light Christmas cake recipe makes a cake of particularly fine texture. Only the whites of the eggs are used, but if you make a dark fruit cake at the same time you can use the yolks of the eggs in the dark cake. Substitute 2 egg yolks for a whole egg in any dark fruit cake recipe and add 1/2 tablespoonful of water to every 2 yolks. This substitution would not be satisfactory in a cake where lightness is desired, but it gives a good rich fruit cake. One and a half cups white sugar, 1/2 pound butter, 4 eggs beaten light, 3 cups flour, 1 teaspoon baking powder, 1/4 teaspoon salt, 1 pound white raisins, 1/2 pound citron peel, 1/2 pound candied cherries, 1/2 pound blanched almonds. Lemon flavoring to suit. Bake in a slow oven (250°F) about 2 hours in paper-lined tins. 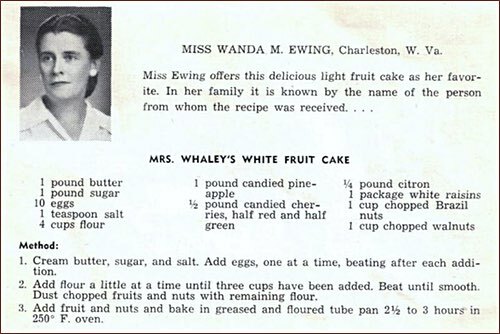 Miss Ewing offers this delicious light fruit cake as her favorite. In her family, it is known by the name of the person from whom the recipe was received. —Miss Wanda M. Ewing, Charleston WV. 1. Cream butter, sugar, and salt. Add eggs, one at a time, beating after each addition. 2. Add flour a little at a time until three cups have been added. Beat until smooth. Dust chopped fruits and nuts with remaining flour. 3. Add fruit and nuts and bake in greased and floured tube pan 2-1/2 to 3 hours in 250°F oven. 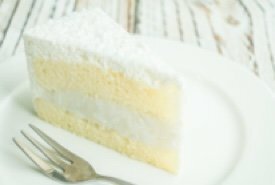 Ingredients: Two and one-half pounds icing sugar (sifted), 4 egg whites (large), juice of 1 lemon, 1 teaspoon glycerine, 4 drops laundry blueing to make the icing snowy white. Method: Place egg whites in a bowl and add sugar very gradually, beating continually until all sugar is added, then add lemon juice, beat again. Add glycerine and blueing and continue beating until very smooth. Don't skimp on the beating. This Royal Icing will be quite hard on the outside, but will not break or crumble when cut, and is perfect for cake decorating purposes. It will make any cake special. Let's face it, not everyone likes the rich taste of dark fruitcakes. Comedians even joke about them, calling them boat anchors or doorstops. 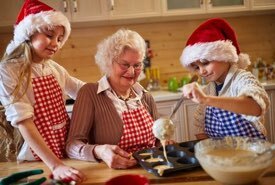 However, those who joke likely have never tasted a homemade dark fruitcake like Grandma's. But, to be fair, while some enjoy the taste of fruit and almonds, they simply prefer a more delicate flavor in their fruitcakes. If that describes you, the good news is you can have your cake and eat it too. Mom's favorite vintage white fruitcakes will please almost everybody. Say, why not give your friends and family a choice this Christmas season? You can make both a light AND a dark fruitcake for the Holidays.